The next phase of self-tracking for health – mood trackers? We just posted our curation of mood tracking apps on wellocracy.com. This prompted me to review just how far self-tracking has come in the last several years. Just four to five years ago we were beginning to understand the power of self-tracking for health. Prior to that, individuals interested in gathering measurable information about their lives resorted to paper journals and Excel spreadsheets and manually entered data from tracking devices themselves. Those that participated were really motivated. We soon started to see the power of passive tracking. In about 2005, my friend Penny Ford-Carleton came up with the term “wear and forget” sensors to call attention to all of the new form factors coming on the market – clip-ons, bandaids, smart clothing, etc. The early versions of these trackers required you to plug them into a computer to offload their data. Being disciplined enough to regularly do the upload and study the data required motivation. Not quite wear and forget, but passive sensing drew us a step closer. The next innovation was to move from wired to wireless data upload. Sensor manufacturers began to routinely put wireless chips into their sensors allowing easy migration of the data from the sensor to some sort of hub and then onto the cloud. The vision of continuous sensing is now upon us. Seamless connectivity through the mobile phone. This is happening quickly. The technology is ready (smartphones, apps, better battery life) and the patient adoption of these devices is increasing fast as well (for example, we saw 65% adoption in a recent ad hoc survey of one of our own underserved patient populations). 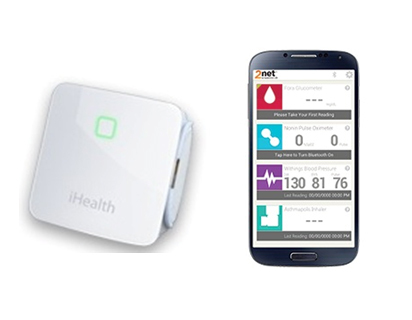 Imagine not needing any hub device but having the wireless sensor pair effortlessly with your smartphone, uploading the data without extra effort on your part. Companies like iHealth are doing this already and many, including industry leader Qualcomm Life are moving in that direction. Increasingly innovative sensors. Right now at the Center for Connected Health, we’re testing two innovative sensors in preparation for the developers to file for FDA clearance. One is a wrist-worn device that measures, among other things, blood pressure continuously without inflating any cuff. The second is a shirt with sensors embedded in the fabric that enable passive tracking of heart rate, respiration, EKG and activity. There is tremendous innovation in this area. Look for more bandaids, pendants, etc. to come our way. Tracking beyond physiology. This may be the most exciting development of the three. Up until now we’ve thought about tracking mainly vital signs (heart rate, blood pressure, weight, blood glucose) and more recently activity, via the myriad of devices for this purpose. But remember, the vision for Connected Health is to make care a continuous function in your daily life – to move beyond the doctor’s office as the only place where care is accomplished. If we’re going to get there, we need to expand tracking beyond vital signs and start to collect data that provides further context for your state of health. It turns out the smartphone is a worthy device to accomplish this as well. Firms like Ginger.io are working on software that can monitor your mobile activities and infer your state of wellness. Their first effort centers around depression, but they will go beyond that. Just think of how much more powerful it will be for your primary care doctor to not only know your blood pressure and activity level, but your mood and state of motivation. This is the context for our excitement about mood trackers. If you read the descriptions of the mood trackers we’re featuring at wellocracy.com, you’ll see that they are pretty primitive at the moment. If you’re motivated, and have the time to open an app on your smartphone, you can record your mood at any time, as well as key in associated places, people, activities, etc. One tracker in particular, Emotion Sense, allows you to enter your mood, but also tracks frequency of phone calls, texts, and other smartphone activity to correlate with your own data entry. It grows smarter as time goes on, predicting your mood from associate data. This sounds a lot like the dawn of physiologic trackers just a few years ago. Emotion Sense and Ginger.io represent the exciting trend in mood tracking, moving as we did in physiologic tracking from active data input to passive ‘wear and forget’ tracking. This type of analysis, combined with physiologic tracking, should lead to very insightful snapshots of your health without you having to enter anything. What’s left? Well, the mood trackers have a few iterations to go before they get really good. Then we have to develop the analytics to merge their data with physiologic data. Finally, it would be really handy to get an analysis of an individual’s state of motivation. This is slightly different than mood. We’ve found motivation or readiness to change to be really important in targeting messages to chronically ill individuals to help them improve their health. Right now all we can do is ask. It’d be great to infer motivational state from mobile phone data. Do you know if anyone is working on this? Thanks so much for calling this to my attention!